Looking for a new CRM? Well, look no further! Delivering enterprise functionality at a small business price, 1CRM is the ultimate CRM system. 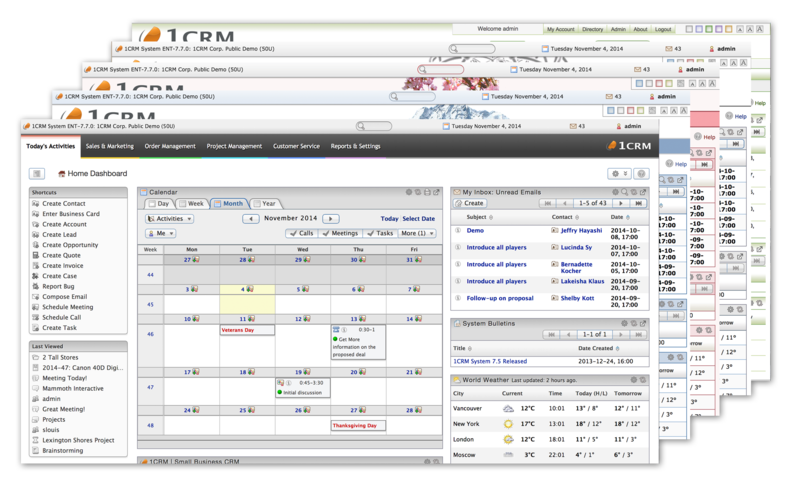 Including all the tools you need to run and grow your business, 1CRM is highly customizable and open source. Create a personalized experience for your customers and yourself with 1CRM. Gone are the days of having your data scattered across different apps and devices. 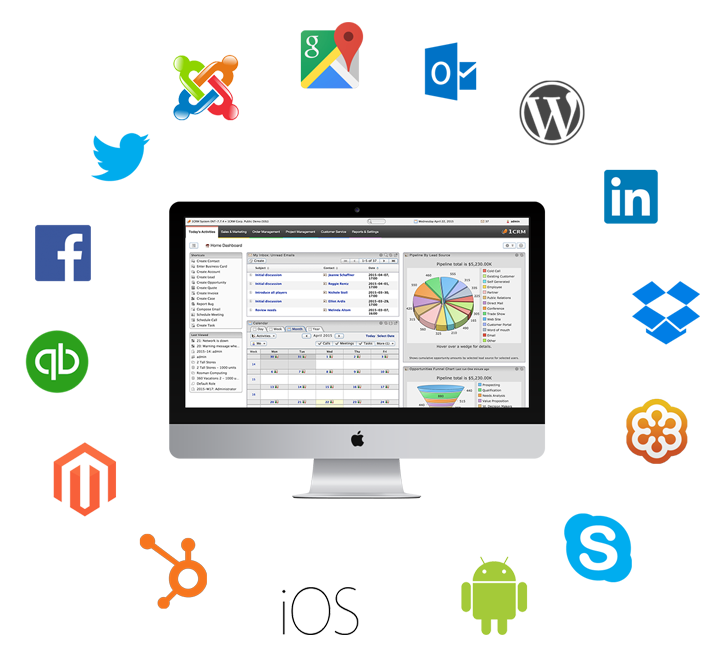 1CRM enables you to access it all from a single integrated online platform. Simply pull in all of your customer & business data from the systems and services you use, and 1CRM will begin tracking your progress immediately. Integrations save time and promote collaboration, by providing access to every tool and every piece of information from a single platform. 1CRM helps you increase customer satisfaction while reducing support costs! Close more deals in less time by automating your sales & marketing processes! 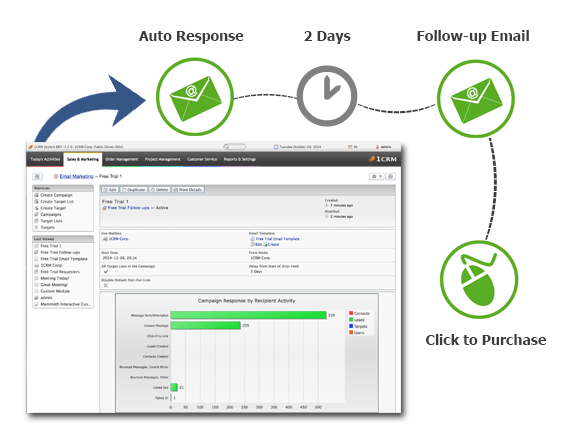 1CRM enables you to generate lead forms, capture leads, and follow up with them – automatically! Create, distribute and track newsletters & email campaigns for multiple target lists. Make informed decisions by tracking your sales pipeline & forecasts with automatically generated reports & charts. Stop wasting time searching for the data you need. Display your key metrics on custom and beautifully designed real-time dashboards, and simply drag-and-drop your data into place. Personalize your 1CRM by creating custom fields, reorganizing menus and screen layouts, editing dropdown options, and designing new print layouts or all-new modules. Access your CRM anywhere, anytime, and from any device. New project? Assign tasks, track progress, and collaborate via private forums & the built-in email system. Create new quotes on-the-spot or create expense reports while still on the road. 1CRM keeps everyone in the know by instantly sharing data across all departments. This reduces mix-ups, saves time, and empowers every employee with the data they need to provide exceptional customer service.